Lally Broch Farm: A Maine Family Homestead: What the WHAT???? 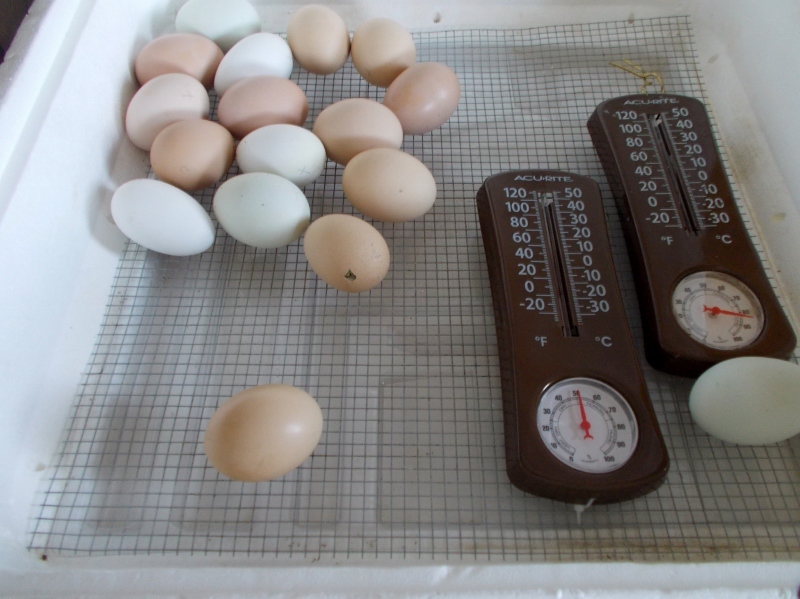 Our incubator still set up and calibrating on the desk in the living room. THAT is a pip. In an egg. That I could have sworn was not living when I candled them and decried the loss of my hatch. On Tuesday, I was so disappointed that I had lost the entire batch of eggs Ryan and I set. I thought it might have been caused by a malfunctioning temperature gauge and Sean brought me home another one. As you can see, the gauge is reading differently, so that IS probably what happened. I had not disposed of all the eggs, though. Sean buries them for me and had not had the time to do so. They weren't hurting anything waiting in the incubator until he could. I also check a final, final time before any of them are discarded- just in case I missed something. On Wednesday, I was picking the eggs up and the one on the front left moved- I thought. I candled it and *Surprise* it was alive and moving! I hadn't posted that update because I didn't want to update you all with that happiness only to have it not survive the hatching. I was waiting and planned to surprise you with the good tidings. 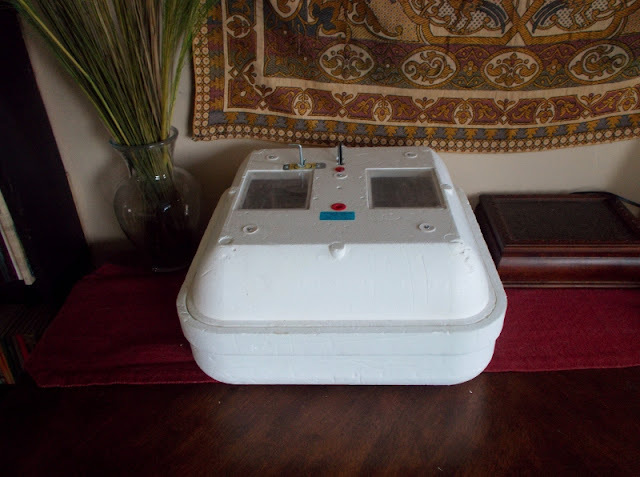 I have been watching the incubator for 2 days since... just hoping and waiting. Last night, when I went to bed (at 2 am because I was at the ER with my eldest daughter- who is fine.) there was no change to the eggs' appearances. This morning, (at 7am) there was a pip in an entirely different egg (that I had seen no life signs in.) I was excited to see this, until I realized that the chick inside, pipped and died all in a few hours. What the WHAT??? There was nothing to be done. Even if I had known it was alive, I would not have intervened until there was no progress for more than 12 hours. This is just the worst hatching. The little egg that I think may be still alive has not pipped through the shell, but definitely looked to have breached the air sac inside. I had to work today until 2pm, so if upon returning home, it has not made any external pips, I may try to see if I can assist it. I had planned on sparing you all the ups and downs of this roller coaster ride of a hatch, but this is just too bizarre! I have no idea what I am going to find when I get home in a couple of hours. Any of you wanting to pray for wisdom for this farm girl and the safe hatching of any little guys that might be- are more than welcome to do so. I sure have been. I am sorry! I hope your youngin is feeling even better now.